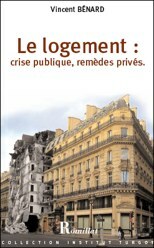 La loi "Renseignement" n’est pas seulement une catastrophe démocratique. C’est une balle, ou plutôt un obus de 155 tiré dans le pied de l’économie française. Ce qui, à terme, provoquera de nouvelles atteintes contre nos libertés. Les Restaus du coeur sont devenus la première entreprise de restauration française avec 2 Millions de repas quotidiens. Aussi son jeune directeur général a-t-il annoncé que "pour faire face aux défis posés par l'augmentation de la pauvreté en France, il n'y a pas d'autre choix que de transformer les restaus en société anonyme"... Avec une introduction en bourse avant la fin de l'année 2015, et la création d'un business model carrément révolutionnaire à la clé ! Les choses bougent-elles en France ? "Le Monde" publie (édition papier du 12 mars, page 28) une tribune où je défends un retour à la constructibilité des terrains par défaut, pour vaincre à la racine le logement trop cher. The first details of Greece’s government plan to reform their country have been released. Though they should be sharpened in the next days, we know that their much awaited fiscal reform relies mostly on “fight” against tax evasion. Enlarging country’s taxpayer base is fine, whether Greece stays in Eurozone or not. Like them or not, Siriza’s measures leaning towards the poorest people, severely hit by the crisis, will require money, and therefore enlarging tax base is the thing to do. But how could Mr Tsipras and his Finance minister Yanis Varoufakis achieve this outcome, without killing incentives to create new businesses in Greece ? Using mere coercion against affluent people won’t be of any usefulness. Both because it has never worked elsewhere, and because affluent people won’t naturally trust a “Far left” labeled government to wage a “fiscal battle” without excesses. MM. Tsipras and Varoufakis could leverage Greece fiscal potential with a conceptually simple idea : “Just don’t try to be a more efficient tax prison against affluent people. Become a Fiscal Heaven instead”. They should embrace… a Flat Tax centered reform. Indeed. Despite being elected under a “far left” flag. Or, more precisely, because the Flat Tax idea is highly left-compliant. Indeed. In every country that have experienced them, huge reforms of tax code centered around the adoption of flat taxes have had a huge positive effect on tax revenues for government. When a flat tax rate under 20%, with no tax exemption, except remittances thresholds for families, is applied, people don’t feel the same need for tax evasion than when marginal taxation exceeds 40 or 50%, or more. Fiscal civism, compliance, becomes the rule, and evasion, exception. Even better, this lower appetite for tax avoidance expands tax bases for other taxes. It’s all the chain of value creation that’s positively impacted: when marginal individual taxation is no more seen as a punishment, people are not only enticed to create value, but to do it in legal ways, without embracing black economy. Thus, in former eastern countries which adopted flat tax centered reforms, not only income tax revenues, but VAT collection and payroll tax collection increased, too. Just think, for example, how a Flat Tax in Russia, despite its very “democratically unperfect” regime, to say the least, allowed to double global tax collection between 2001 and 2005, helping a wrought economy to begin its recovery, and the government to pay its duties towards civil servants and welfare recipients, including arrears. Oh, and Russia saw a huge decrease in its debt to GDP ratios, too. This should appeal both to Siriza’s leader, and to Eurogroup negotiators. And even if the Crisis hit Greece so hardly, the country is not in a worse shape than Russia in 2001. Even if they don’t have oil reserves to help them, they have a potential to attract huge inflows of foreign investments, provided they remain in the European Union. Even more, with reasonable amnesty conditions combined with a stable Flat Tax, Greece could attract back billions of abroad greek money. Greece has the potential to become an economic mediterranean growth hotspot. I don’t know Greece current tax structure, I don’t know anything about the cost of their projected so called social policies. But countries like slovakia succeeded to meet their end and achieve huge growth figures with a very simple 19% VAT/19% revenue/19% corporate flat tax. I guess Greece, which is not in a worse shape than Slovakia after its creation, could take profit from rates of the same order. Greece has a potential to see a huge comeback of both industrial and tertiary investment, if the fiscal environment is viewed as stable and competitive. Of course, it could be a necessary step, but not sufficient. Bureaucratic burden on entrepreneurs should certainly be reduced, too. But especially in Greece, Flat Tax has a huge potential to be the central piece of a new economic success story. Ok, Flat Taxes and pro-entrepreneur policies are generally not viewed as “fair” policy tools by socialists. But is this preconception… fair ? When excessive marginal tax rates incentivize the most affluent people to leave, or at least to offshore their money, money hungry governments have no other choices than pressuring more and more the middle class. Even IMF, despite not favoring Flat taxes, had to acknowledge that flat tax adoption in former soviet countries actually increased the share of the fiscal burden paid by the high income individuals and corporations. This could be labelled as “tax fairness” by many. It might seem preposterous to expect, from a left side government, such a policy totally at opposite of what Siriza’s voters could imagine. But, as we don’t see any other way to fix Greece’s budget and debt woes, endorsing such a radical fiscal plan could serve as a basis to negotiate compensations with corporate organisations: better dialogue between workers and employers, better respect of contracts, better discussions with worker representatives to improve working conditions, wages, or lifetime training for less skilled workers, could be part of the deal. Opposition to a fiscal amnesty for past tax evasion could be overcome, too. Combined with much business friendly marginal rates, this forgiveness for past fiscal misconduct could be associated with more severe sanctions for further tax evasions: this could sound like a good tradeoff for far left electors. The Greek economy could provide more jobs, and the conditions of making these jobs more satisficing both for investors and workers could be met. That’s real fairness. More jobs. Better working conditions. More money for the state’s welfare policies. A bigger part of budget financed by rich people. Much more fiscal compliance. Isn’t that the trademark of a “leftist” political agenda ? But let’s go a little further: M. Tsipras and M. Varoufakis could leave their names to history, being the first “far left” government to break the usual game between right and left, and giving up the idea that taxes should be a way to wage a class warfare, by punishing the riches, and this, without sacrificing social improvement of working and living conditions. And let’s admit it: such a “libertarian left” experiment, if successful, could be a huge game changer in french politics, too. Believe it or not: Flat Tax is the best card in Mr Tsipras’ hands. Will he be audacious enough to put it on the table, against all established political expectations ? 99% des économistes actuels nous affirment, la main sur le cœur, que la baisse généralisée des prix, qu'ils appellent improprement "déflation", serait un terrible danger pour nos économies. Faut il les croire ? Vous qui connaissez mon mauvais esprit contrariant sur à peu près tous les sujets de réflexion que cette terre nous fournit, vous vous doutez que si je pose la question en ces termes, c'est que ma réponse est un NON catégorique. VIVE LA DÉFLATION ! Métro Grand Paris: faut il vraiment y investir 27 milliards (minimum) ? Un rapport d'un think tank non gouvernemental vient confirmer, chiffres détaillés à l’appui, mes craintes exprimées il y a 4 ans concernant le projet du “Métro Grand Paris”, trop cher et d’une utilité contestable. Le rapport propose de surseoir à cet investissement disproportionné et de se focaliser sur des améliorations indispensables au réseau existant, pour 5 fois moins cher. Interview pour Atlantico : Duflot, quel bilan ? Co-interview avec Julien Damon et Thomas Guénolé, pour Atlantico, à propos des années Duflot au ministère du Logement. Tonalité générale: "Cécile Duflot a certes eu une action nuisible, mais elle n'est sûrement pas la seule, et tout lui mettre sur le dos, comme le fait Valls, cache peut être une volonté de chercher des boucs émissaires plutôt que d'entreprendre de vraies et courageuses réformes".